Old school - in a beautiful way. Everything about this pub is perfect. 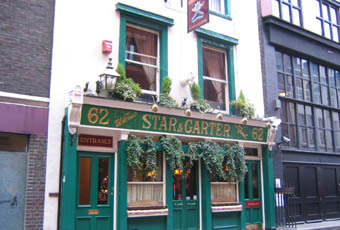 An excellent old-style pub in Soho. Basic furniture, no fripperies and a mixed clientele. Heaving on a Thursday evening with three times as many on the street as in the pub. Beer's a bit uninspiring, but three real ales on handpump (Pride, GK IPA and Spitfire). The Pride was excellent when I visited. Watch out for the dark-haired barmaid with fantastic cleavage. The previous comments can only be repeated, the pub still offers a nice welcome in a traditional setting and I felt immediately relaxed in here. The beer choice appears to be exactly the same as reported in September 2009 - namely GK IPA, Spitfire and London Pride. Whilst it offered no surprises, as suggested elsewhere, it obviously attracts those in the area who need a little respite from the Soho landscape, and who can fault that ? A really enjoyable place to relax and enjoy a beer. Good staff, drinks and general ambience. Music playing in the background. A top old school boozer. I'd definitely return here.